The Echo Show has a 7" touchscreen, dual 2-inch stereo speakers, a 5MP front-facing camera for video calls, and an 8-microphone array. The screen is used to provide visual feedback for Alexa skills, or to see the other person with Echo video calls. For example, you can watch news briefings, display a cooking recipe, or show your calendar. And of course, it can do everything the other Echos can do. 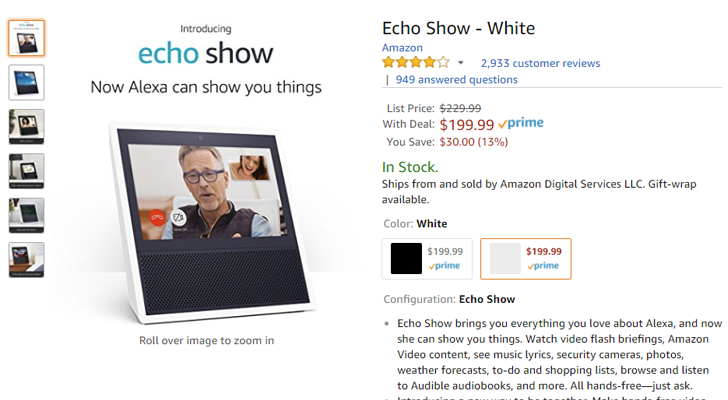 The Echo Show appears to be discounted almost everywhere it's sold. You can buy it from various retailers below.